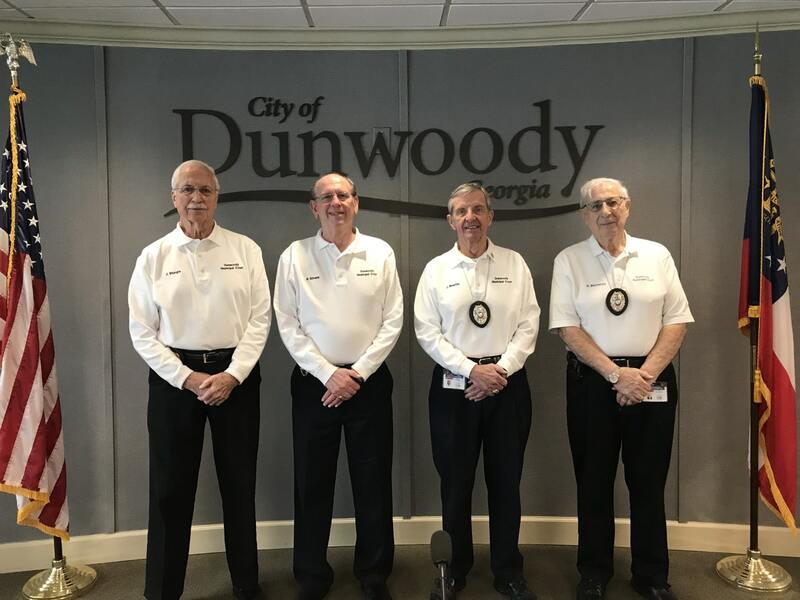 Jim Sturgis, Ron Silvers, Jim Beattie and Stan Bernstein are celebrating 10 years of service as volunteer bailiffs for the Dunwoody Municipal Court. “After a career in law and law enforcement, being a volunteer bailiff is a great opportunity to serve again, if only on the sidelines, with the added benefit of watching our new city evolve,” Sturgis explained. It’s rare for courts to have volunteer bailiffs. The idea started as a way to save tax dollars and keep police officers on the streets. Dunwoody’s court system began operating in February 2009, just three months after Dunwoody officially became a city. Since then, the number of volunteers and positions has changed. Today, thirteen volunteers cover an average of three court sessions every week. “After each session, I feel that I’ve been helpful to someone who came to court frightened, confused and remorseful,” said Roy Ethridge, who began his service as a bailiff a couple of months ago. Bailiffs are an important part of the municipal court operation. During each court session, there are typically five bailiffs and two armed police officers present. The police officers provide courtroom security for defendants, judges and prosecutors, while the bailiffs assist with tasks such as checking in defendants, swearing in witnesses, directing visitors to solicitor and probation offices, and handling court paperwork. Dunwoody’s bailiffs are mostly retired, long-time Dunwoody residents. Some, but not all, have law enforcement backgrounds. Many perform volunteer service as a civic duty while others enjoy the social aspect of the program. Together, they have provided more than 10,000 volunteer hours since the Court’s inception.